I’ve gone to two burger joints that serve sweet potato fries. You know the drill. Walk in, sit down, order my burger without the bun please and you do use 100% all beef in your burgers right? Yep. Good to go. Now what to eat with it. Regular fries, a side salad…… oh what’s this? 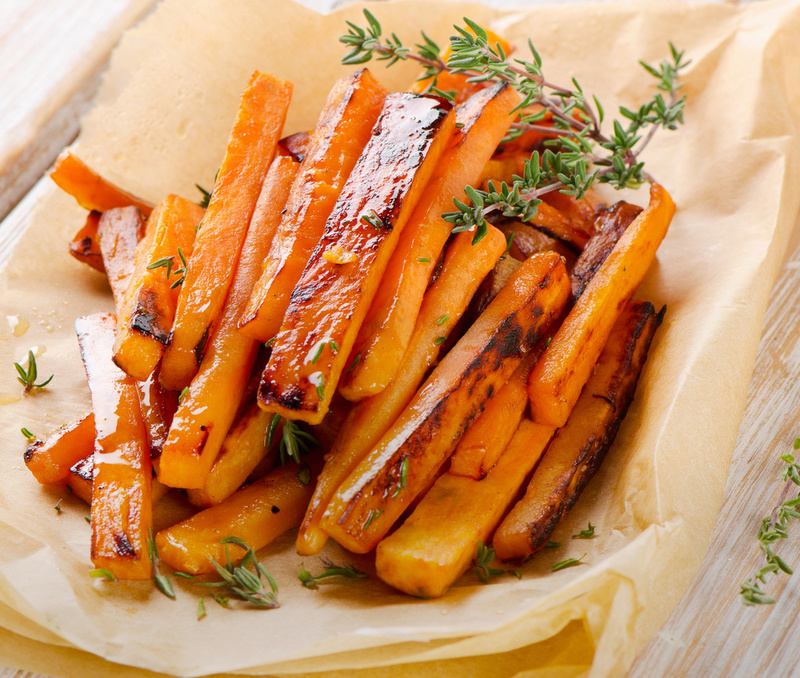 Sweet potato fries? Never had em before. Let’s be daring and order some. Wow! These are good. And I love sweet potatoes! I need to make these at home. So here’s another of my easy gluten free recipes to make them yourself. No need to pay $5 bucks at the local burger joint. Shoot, I can make enough fries at that price for the whole week, though I might get tired of them by then. Crank up the oven to 400 degrees. Yes, we are going to bake them, not deep fry them. If you want to fry, heat up enough oil in a large dutch oven and put on your spatter-proof clothing. 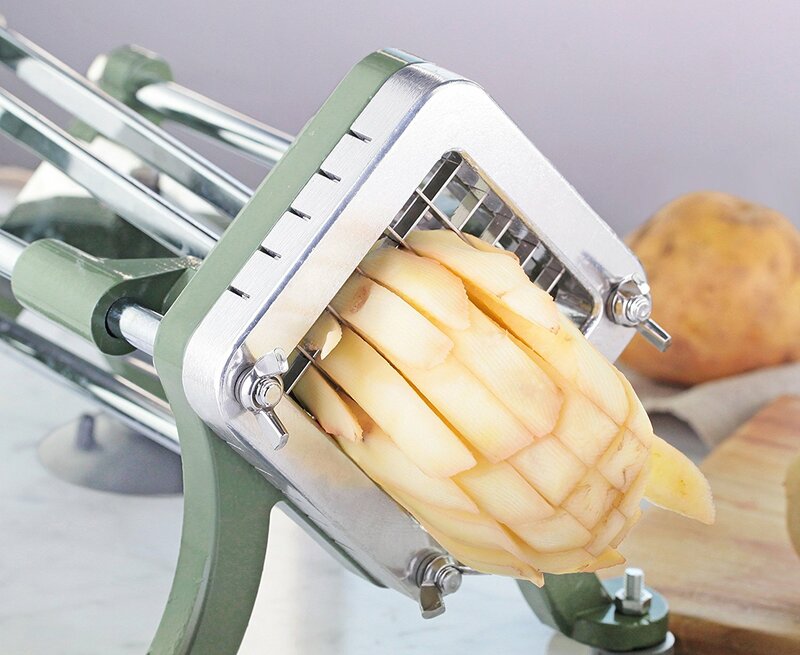 Now, to cut up your sweet potatoes, you could use a knife and cutting board and do it the BORING way or….You could get a nifty french fry chopper from Amazon. This thing is soooo cool. Go check it out. It has great reviews and is heavy enough to cut through. Put the fries in a large zip bag. Add the oil, close it up and mush with your hands to coat everything. Open up the bag again and then sprinkle in the pumpkin pie spice and the chili seasoning. Mush again with your hands to coat everything then dump them on a parchment lined baking sheet. Bake them for 30 to 35 minutes, make sure to turn them over once half way through. Pull out of the oven and fend off the hordes. You might find you need to make double batches of these. 2 lbs. may not be enough! 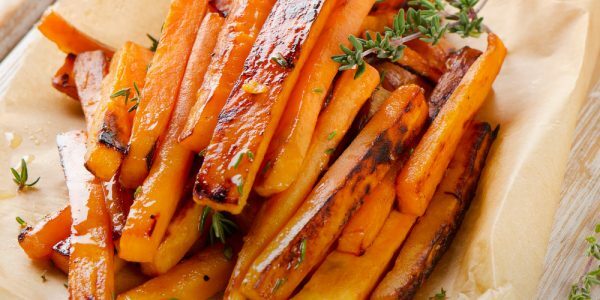 Sweet potatoes are an amazing food. Don’t wait for the holidays to serve them. If you click on the links on this page, I will receive a small commission for it. It is greatly appreciated. I have found several web sites for people with Celiac , but my husband cannot have eggs or any nitrates or nitrites and msg. The latter three allergens I’ve managed to figure out. But I have had an awful time baking without eggs. I have used different egg substitues with little to no success. Do you have any suggestions that could help with my baking. As an elderly couple learning a new way to bake is sometimes troubling. My other suggestions are to make recipes that use only 1 egg. Small batch baking recipes, recipes for two people only, things like that. You can also check out any vegan recipes for ideas on how to substitute eggs. The sweet potato chips at my local restaurant are not gluten free. So it”s best to check I’m afraid before tucking in. Yes, you have to ask and be sure. We have a few restaurants here that serve gluten free sweet potato fries. Very lucky!